Happy Friday friends! Today I’m participating in the Blog tour for At First Glance which is a contemporary romance novel that I LOVED! I read it last weekend and it gave me all of the Hallmark Christmas movies feels (without the Christmas part.) So if you like those movies, I highly recommend this book! 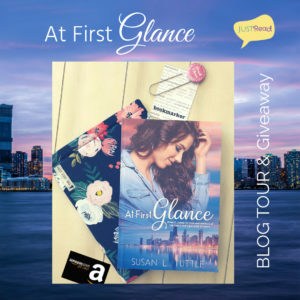 Welcome to the Blog Tour & Giveaway for At First Glance by Susan L. Tuttle, hosted by JustRead Publicity Tours! Estate planner Penny Thornton loves dusting off items others gloss over, especially since she relates to feeling tossed aside for the “bright and shiny”. When her younger sister’s approaching wedding launches Penny back into the throes of her dysfunctional family, she decides to use the festivities to close the gap in their relationships—even if it means appeasing them and finally losing the few pounds they’ve hounded her about for years. But she doesn’t expect to meet two very different men in the process. East Fisher, the personal trainer who personifies everything she believes she could never attain, and Jonah Black, a man who reminds her so much of herself. Both men are more than they appear at first glance, and both seem interested in her romantically. As Penny uncovers their hidden layers, she discovers when it comes to love and matters of the heart, she’s got a lot to learn about estimating value. It was a dream she wasn’t ready to let slip past her tongue out into reality. Not when the man across from her was far from who she dreamed of fulfilling that role. And yet still, somehow, kept pulling her farther into him. “I’ll let you know when I’ve got it figured out,” she lied. Like earlier in the elevator, that gaze of his delved into her again, made her feel seen. The connection was unlike anything she’d felt before. It held an intensity she wasn’t ready for. He was only a friend. Not what she expected. Not what she needed. Or maybe everything she needed. Enter via the Rafflecopter giveaway below. Giveaway will begin at midnight November 5, 2018 and last through 11:59pm November 12, 2018. US only. Winners will be notified within a week of close of the giveaway and given 48 hours to respond or a new winner will be chosen. Oh thank you so much for celebrating with me! I’m so glad you love the book!! It was such a great read! I’m glad I could celebrate with you and share your book with my readers! Love this cover can’t wait to read this. It was a great read! And it’s just beautiful to look at! 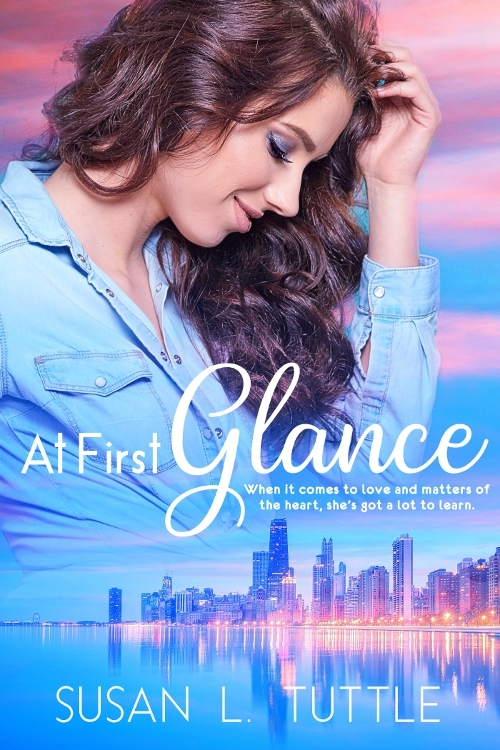 Thank you for your recommendation on “At First Glance” by Susan L. Tuttle and for being part of the blog tour hosted by JustRead Publicity Tours. I can’t wait for the opportunity to read this wonderful sounding book. You’re welcome! It was such a great read, and I really do think more people should read it! Beautiful cover! I am so excited to read this! It does have a gorgeous cover! And it was such a fun read!